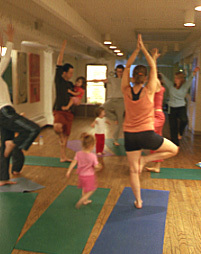 Classes include child-friendly yoga with songs, stories, and games to create an enriching activity. Each class includes a playful theme (beach, camping, zoo, rainforest, etc.). Children experience stretches, poses, breathwork, games, simple meditation, and relaxation. They have the opportunity to play and explore in a non-competitive environment. We work on strength, balance, self-confidence, respect for self and others, as well as finding joy and vitality in our bodies. Through yoga, they learn social interaction, repetition, and play -- as well as how to relieve frustration, improve motor skills, and increase attention span by actively following directions. Help your child build the foundation for a healthy and fit lifestyle while having fun! Please bring a yoga or exercise mat (or two) if you have and a water bottle, and wear comfortable clothes. Classes are age-specific and sometimes offered with parents (or caregivers) and sometimes just with the chidlren (see detailed class descriptions). Please complete the online form to join a class.